Yarn Type SALE 30% OFF! Light yarn with a slight boucle effect which enables you to knit chunky looking garments that are still comfortably light to wear. Soft to touch too. 42% Cotton, 33% Acrylic, 15% Wool, 10% Nylon. Cold hand wash	May be dry cleaned, Do not iron, Reshape whilst wet, Do not tumble dry, Dry flat. 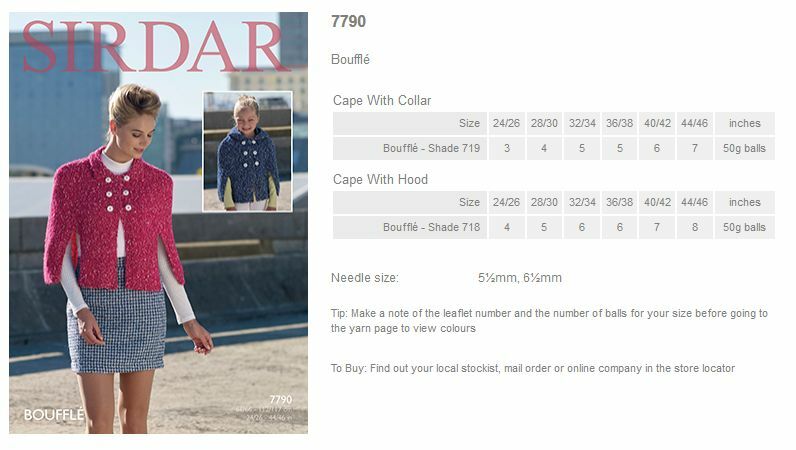 Leaflet with designs for a Cape with Collar and Cape with Hood using Sirdar Bouffle. Leaflet with designs for a Womens Poncho using Sirdar Bouffle. Leaflet with designs for a Womens Shawl and Gloves using Sirdar Bouffle. Leaflet with designs for Womens Hats and Scarves using Sirdar Bouffle. Leaflet with designs for a Womens Sweater using Sirdar Bouffle. Leaflet with designs for a Womens Jacket using Sirdar Bouffle. Leaflet with designs for a Womens Skirt and Top using Sirdar Bouffle.